Tormo, A. J., Rafei, M. and Gauchat, J. (2014). Isolation of Multipotent Stromal Cells from Mouse Bone Marrow. Bio-protocol 4(4): e1031. DOI: 10.21769/BioProtoc.1031. Generating mouse multipotent stromal cells (MSC) from bone-marrow cells is usefull for a wide range of applications. Effectively, these MSC can differentiate into adipocytes, osteocytes [See “Binding to Secreted Bone Matrix in vitro” (Tormo et al., 2014)] or chondrocytes upon culture in specific differentiation medium. 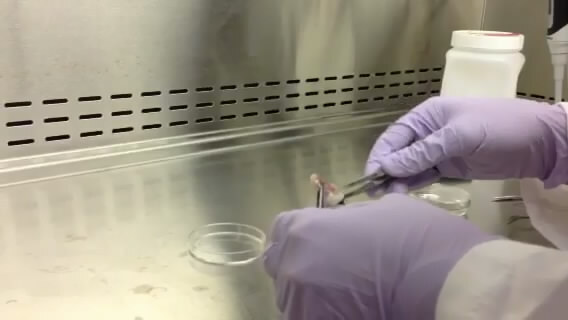 Under culture hood, flush tibia and femora from one 6-8 weeks old mouse with FBS-free DMEM in a dish with DMEM previously warm at 37 °C (see Video 1). With a syringe and needle, aspirate and eject 2-3 times the bonne marrow to disrupt it. Transfer in a 50 ml conical tube. Centrifuge 10 min at 430 x g at 4 °C. Resuspend the pellet with DMEM supplemented with 15% FBS and Penicillin/Streptomycin at a density of 106 cells/ml. Plate 1 x 107 cells (10 ml) in a T25 flask. Incubate at 37 °C-5 % CO2 for 7-10 days without changing medium. Remove the supernatant in order to keep only adherent cells and wash the flask 2 times with 5 ml of PBS. Trypsinize cells for expansion. For cells trypsinization: add 0.5 ml of trypsin on the rinsed cells. Wait 3 to 5 min until cells peel off the plastic surface. Transfer cells in a 15 ml tube and add quickly 10 ml of DMEM containing 10% FBS in order to inhibit trypsin action. After 7 - 10 days, assess the phenotype of the growing adherent cells by flow cytometry. Stain cells with fluorescein isothiocyanate (FITC)-labeled anti-CD45 (clone 30-F11) and with allophycocyanine (APC)-labeled anti-CD31 (clone MEC133). These antibody should be diluted 1/200. Cells should be negative for these two markers as CD45 is a hematopoietic cells marker, and CD31 is an endothelial cells marker. Stain cells with APC-labeled anti-CD44 (clone IM7), phycoerythrin (PE)-labeled anti-CD105 (clone MJ7/18) and with FITC-labeled anti-CD90 (clone 5E10), all used at a 1/200 dilution. Cells should be positive for these three markers. This protocol is adapted from Tormo et al. (2013). Tormo, A. J., Beaupre, L. A., Elson, G., Crabe, S. and Gauchat, J. F. (2013). A polyglutamic acid motif confers IL-27 hydroxyapatite and bone-binding properties. J Immunol 190(6): 2931-2937. Tormo, A. J., Beauséjour, C. and Gauchat, J. F. (2014). Binding to secreted bone matrix in vitro. Bio-protocol 4(4): e1030. How to cite: Tormo, A. J., Rafei, M. and Gauchat, J. (2014). Isolation of Multipotent Stromal Cells from Mouse Bone Marrow. Bio-protocol 4(4): e1031. DOI: 10.21769/BioProtoc.1031.